Proprietary Name: Clonidine What is the Proprietary Name? Non-Proprietary Name: Clonidine What is the Non-Proprietary Name? Clonidine with NDC 50742-247 is a a human prescription drug product labeled by Ingenus Pharmaceuticals, Llc. The generic name of Clonidine is clonidine. The product's dosage form is tablet, extended release and is administered via oral form. FDA Application Number: ANDA209675 What is the FDA Application Number? Clonidine hydrochloride extended-release tablets is an extended-release tablet to be taken orally with or without food. Swallow tablets whole. Do not crush, chew, or break tablets because this will increase the rate of clonidine release.Due to the lack of controlled clinical trial data and differing pharmacokinetic profiles, substitution of clonidine hydrochloride extended-release tablets for other clonidine products on a mg-per-mg basis is not recommended [see Clinical Pharmacology (12.3)]. The dose of clonidine hydrochloride extended-release tablets, administered either as monotherapy or as adjunctive therapy to a psychostimulant, should be individualized according to the therapeutic needs and response of the patient. Dosing should be initiated with one 0.1 mg tablet at bedtime, and the daily dosage should be adjusted in increments of 0.1 mg/day at weekly intervals until the desired response is achieved. Doses should be taken twice a day, with either an equal or higher split dosage being given at bedtime (see Table 1).Doses of clonidine hydrochloride extended-release tablets higher than 0.4 mg/day (0.2 mg twice daily) were not evaluated in clinical trials for ADHD and are not recommended.When clonidine hydrochloride extended-release tablets is being added-on to a psychostimulant, the dose of the psychostimulant can be adjusted depending on the patient's response to clonidine hydrochloride extended-release tablets. Abrupt discontinuation of clonidine hydrochloride extended-release tablets can cause rebound hypertension. In adults with hypertension, sudden cessation of clonidine hydrochloride extended- release formulation treatment in the 0.2 to 0.6 mg/day range resulted in reports of headache, tachycardia, nausea, flushing, warm feeling, brief lightheadedness, tightness in chest, and anxiety. In adults with hypertension, sudden cessation of treatment with immediate-release clonidine has, in some cases, resulted in symptoms such as nervousness, agitation, headache, and tremor accompanied or followed by a rapid rise in blood pressure and elevated catecholamine concentrations in the plasma. No studies evaluating abrupt discontinuation of clonidine hydrochloride extended-release tablets in children with ADHD have been conducted; however, to minimize the risk of rebound hypertension, gradually reduce the dose of clonidine hydrochloride extended-release tablets in decrements of no more than 0.1 mg every 3 to 7 days. Patients should be instructed not to discontinue clonidine hydrochloride extended-release tablets therapy without consulting their physician due to the potential risk of withdrawal effects. In patients who have developed localized contact sensitization to clonidine transdermal system, continuation of clonidine transdermal system or substitution of oral clonidine hydrochloride extended-release tablets therapy may be associated with the development of a generalized skin rash.In patients who develop an allergic reaction from clonidine transdermal system, substitution of oral clonidine hydrochloride extended-release tablets may also elicit an allergic reaction (including generalized rash, urticaria, or angioedema). 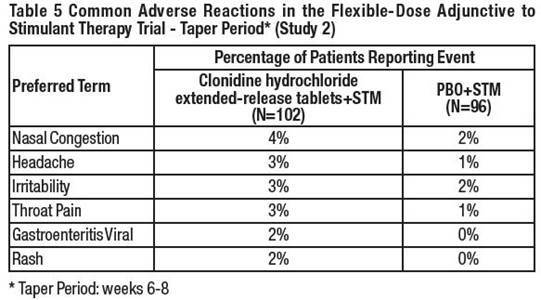 Because clinical trials are conducted under widely varying conditions, adverse reaction rates observed in the clinical trials of a drug cannot be directly compared to rates in the clinical trials of another drug and may not reflect the rates observed in practice.Two clonidine hydrochloride extended-release tablets ADHD clinical studies (Study 1, CLON-301 and Study 2, CLON-302) evaluated 256 patients in two 8-week placebo-controlled studies. A third clonidine hydrochloride extended-release tablets ADHD clinical study (Study 3, SHN-KAP-401) evaluated 135 children and adolescents in a 40- week placebo-controlled randomized-withdrawal study.Study 1: Fixed-dose clonidine hydrochloride extended-release tablets MonotherapyStudy 1 (CLON-301) was a short-term, multi-center, randomized, double-blind, placebo-controlled study of two fixed doses (0.2 mg/day or 0.4 mg/day) of clonidine hydrochloride extended-release tablets in children and adolescents (6 to 17 years of age) who met DSM-IV criteria for ADHD hyperactive or combined inattentive/hyperactive subtypes.Most Common Adverse Reactions (incidence of 5% and at least twice the rate of placebo): somnolence, fatigue, irritability, insomnia, nightmare, constipation, dry mouth.Adverse Events Leading to Discontinuation of clonidine hydrochloride extended-release tablets –Five patients (7%) in the low dose group (0.2 mg), 15 patients (20%) in the high dose group (0.4 mg), and 1 patient in the placebo group (1%) reported adverse reactions that led to discontinuation. 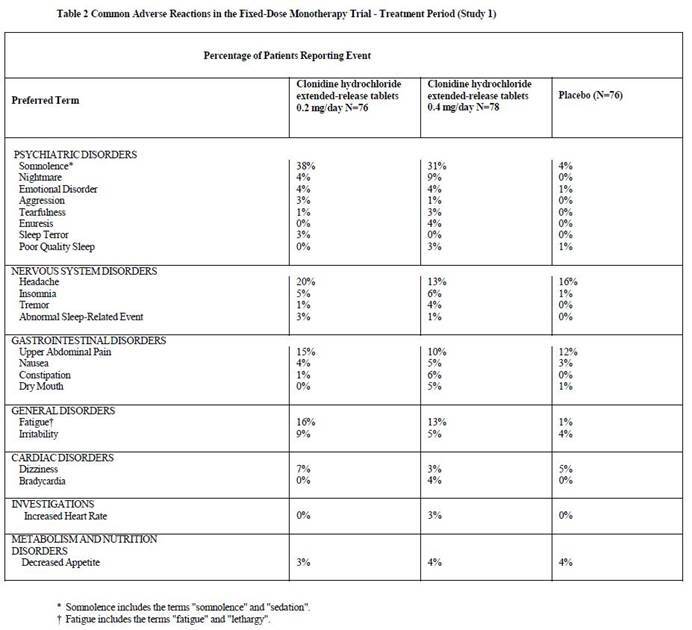 The most common adverse reactions that led to discontinuation were somnolence and fatigue.Commonly observed adverse reactions (incidence of 2% in either active treatment group and greater than the rate on placebo) during the treatment period are listed in Table 2.Commonly observed adverse reactions (incidence of 2% in either active treatment group and greater than the rate on placebo) during the taper period are listed inTable 3.Study 2: Flexible-dose clonidine hydrochloride extended-release tablets as Adjunctive Therapy to PsychostimulantsStudy 2 (CLON-302) was a short-term, randomized, double-blind, placebo-controlled study of a flexible dose of clonidine hydrochloride extended-release tablets as adjunctive therapy to a psychostimulant in children and adolescents (6 to 17 years) who met DSM-IV criteria for ADHD hyperactive or combined inattentive/hyperactive subtypes. during which clonidine hydrochloride extended-release tablets was initiated at 0.1 mg/day and titrated up to 0.4 mg/day over a 3-week period. Most clonidine hydrochloride extended-release tablets treated patients (75.5%) were escalated to the maximum dose of 0.4 mg/day.Most Common Adverse Reactions (incidence of 5% and at least twice the rate of placebo): somnolence, fatigue, decreased appetite, dizziness.Adverse Events Leading to Discontinuation – There was one patient in the CLON+STM group (1%) who discontinued because of an adverse event (severe bradyphrenia, with severe fatigue).Commonly observed adverse reactions (incidence of 2% in the treatment group and greater than the rate on placebo) during the treatment period are listed in Table 4.Commonly observed adverse reactions (incidence of 2% in the treatment group and greater than the rate on placebo) during the taper period are listed in Table 5.Adverse Reactions Leading to DiscontinuationThirteen percent (13%) of patients receiving clonidine hydrochloride extended-release tablets discontinued from the pediatric monotherapy study due to adverse events, compared to 1% in the placebo group. The most common adverse reactions leading to discontinuation of clonidine hydrochloride extended-release tablets monotherapy treated patients were from somnolence/sedation (5%) and fatigue (4%).Effect on Blood Pressure and Heart RateIn patients that completed 5 weeks of treatment in a controlled, fixed-dose monotherapy study in pediatric patients, during the treatment period the maximum placebo-subtracted mean change in systolic blood pressure was -4.0 mmHg on clonidine hydrochloride extended-release tablets 0.2 mg/day and -8.8 mmHg on clonidine hydrochloride extended-release tablets 0.4 mg/day. The maximum placebo-subtracted mean change in diastolic blood pressure was -4.0 mmHg on clonidine hydrochloride extended-release tablets 0.2 mg/day and -7.3 mmHg on clonidine hydrochloride extended-release tablets 0.4 mg/day. The maximum placebo-subtracted mean change in heart rate was -4.0 beats per minute on clonidine hydrochloride extended-release tablets 0.2 mg/day and -7.7 beats per minute on clonidine hydrochloride extended-release tablets 0.4 mg/day.During the taper period of the fixed-dose monotherapy study the maximum placebo-subtracted mean change in systolic blood pressure was +3.4 mmHg on clonidine hydrochloride extended-release tablets 0.2 mg/day and -5.6 mmHg on clonidine hydrochloride extended-release tablets 0.4 mg/day. The maximum placebo-subtracted mean change in diastolic blood pressure was +3.3 mmHg on clonidine hydrochloride extended-release tablets 0.2 mg/day and -5.4 mmHg on clonidine hydrochloride extended-release tablets 0.4 mg/day. The maximum placebo-subtracted mean change in heart rate was -0.6 beats per minute on clonidine hydrochloride extended-release tablets 0.2 mg/day and -3.0 beats per minute on clonidine hydrochloride extended-release tablets 0.4 mg/day. Pregnancy Category C:Risk SummaryThere are no adequate or well-controlled studies with clonidine hydrochloride extended-release tablets in pregnant women. In animal embryofetal studies, increased resorptions were seen in rats and mice administered oral clonidine hydrochloride from implantation through organogenesis at 10 and 5 times, respectively, the maximum recommended human dose (MRHD). No embryotoxic or teratogenic effects were seen in rabbits administered oral clonidine hydrochloride during organogenesis at doses up to 3 times the MRHD. Clonidine hydrochloride extended-release tablets should be used during pregnancy only if the potential benefit justifies the potential risk to the fetus.Animal DataOral administration of clonidine hydrochloride to pregnant rabbits during the period of embryo/fetal organogenesis at doses of up to 80 mcg/kg/day (approximately 3 times the oral maximum recommended daily dose [MRHD] of 0.4 mg/day on a mg/m2 basis) produced no evidence of teratogenic or embryotoxic potential. In pregnant rats, however, doses as low as 15 mcg/kg/day (1/3 the MRHD on a mg/m2 basis) were associated with increased resorptions in a study in which dams were treated continuously from 2 months prior to mating and throughout gestation. Increased resorptions were not associated with treatment at the same or at higher dose levels (up to 3 times the MRHD) when treatment of the dams was restricted to gestation days 6-15. Increases in resorptions were observed in both rats and mice at 500 mcg/kg/day (10 and 5 times the MRHD in rats and mice, respectively) or higher when the animals were treated on gestation days 1-14; 500 mcg/kg/day was the lowest dose employed in this study. The safety and efficacy of clonidine hydrochloride extended-release tablets in the treatment of ADHD have been established in pediatric patients 6 to 17 years of age. Use of clonidine hydrochloride extended-release tablets in pediatric patients 6 to 17 years of age is supported by three adequate and well-controlled studies; a short-term, placebo-controlled monotherapy trial, a short- term adjunctive therapy trial and a longer-term randomized monotherapy trial [see Clinical Studies (14)]. Safety and efficacy in pediatric patients below the age of 6 years has not been established.Juvenile Animal DataIn studies in juvenile rats, clonidine hydrochloride alone or in combination with methylphenidate had an effect on bone growth at clinically relevant doses and produced a slight delay in sexual maturation in males at 3 times the maximum recommended human dose (MRHD) for clonidine and methylphenidate.In a study where juvenile rats were treated orally with clonidine hydrochloride from day 21 of age to adulthood, a slight delay in onset of preputial separation (delayed sexual maturation) was seen in males treated with 300 mcg/kg/day, which is approximately 3 times the MRHD of 0.4 mg/day on a mg/m2 basis. The no-effect dose was 100 mcg/kg/day, which is approximately equal to the MRHD. There was no drug effects on fertility or on other measures of sexual or neurobehavioral development.In a study where juvenile rats were treated with clonidine alone (300 mcg/kg/day) or in combination with methylphenidate (10 mg/kg/day in females and 50/30 mg/kg/day in males; the dose was lowered from 50 to 30 mg/kg/day in males due to self- injurious behavior during the first week of treatment) from day 21 of age to adulthood, decreases in bone mineral density and mineral content were observed in males treated with 300 mcg/kg/day clonidine alone and in combination with 50/30 mg/kg/day methylphenidate and a decrease in femur length was observed in males treated with the combination at the end of the treatment period. These doses are approximately 3 times the MRHD of 0.4 mg/day clonidine and 54 mg/day methylphenidate on a mg/m2 basis. All these effects in males were not reversed at the end of a 4-week recovery period. In addition, similar findings were seen in males treated with a lower dose of clonidine (30 mcg/kg/day) in combination with 50 mg/kg/day of methylphenidate and a decrease in femur length was observed in females treated with clonidine alone at the end of the recovery period. These effects were accompanied by a decrease in body weight gain in treated animals during the treatment period but the effect was reversed at the end of the recovery period. A delay in preputial separation (sexual maturation) was observed in males treated with the combination treatment of 300 mcg/kg/day clonidine and 50/30 mg/kg/day methylphenidate. There was no effect on reproduction or sperm analysis in these males. SymptomsClonidine overdose: hypertension may develop early and may be followed by hypotension, bradycardia, respiratory depression, hypothermia, drowsiness, decreased or absent reflexes, weakness, irritability and miosis. The frequency of CNS depression may be higher in children than adults. Large overdoses may result in reversible cardiac conduction defects or dysrhythmias, apnea, coma and seizures. Signs and symptoms of overdose generally occur within 30 minutes to two hours after exposure.TreatmentConsult with a Certified Poison Control Center (1-800-222-1222) for up-to-date guidance and advice. Clonidine hydrochloride extended-release is a centrally acting alpha2-adrenergic agonist available as 0.1 mg extended-release tablets for oral administration. The tablet is equivalent to 0.087 mg, of the free base.The inactive ingredients are povidone, sodium lauryl sulfate, lactose monohydrate, microcrystalline cellulose, hypromellose, colloidal silicon dioxide and magnesium stearate. The formulation is designed to delay the absorption of active drug in order to decrease peak to trough plasma concentration differences. Clonidine hydrochloride is an imidazoline derivative and exists as a mesomeric compound. The chemical name is 2-(2,6-dichlorophenylamino)? 2-imidazoline hydrochloride. The following is the structural formula:Clonidine hydrochloride is an odorless, bitter, white, crystalline substance soluble in water and alcohol. Single-dose Pharmacokinetics in AdultsImmediate-release clonidine hydrochloride and clonidine hydrochloride extended-release tablets have different pharmacokinetic characteristics; dose substitution on a milligram for milligram basis will result in differences in exposure. 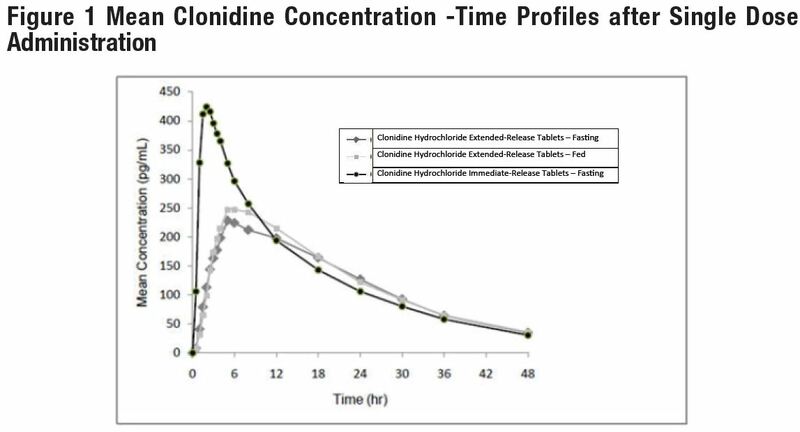 A comparison across studies suggests that the Cmax is 50% lower for clonidine hydrochloride extended-release tablets compared to immediate-release clonidine hydrochloride.Following oral administration of an immediate release formulation, plasma clonidine concentration peaks in approximately 3 to 5 hours and the plasma half- life ranges from 12 to 16 hours. The half-life increases up to 41 hours in patients with severe impairment of renal function. Following oral administration about 40-60% of the absorbed dose is recovered in the urine as unchanged drug in 24 hours.About 50% of the absorbed dose is metabolized in the liver. Although studies of the effect of renal impairment and studies of clonidine excretion have not been performed with clonidine hydrochloride extended-release tablets, results are likely to be similar to those of the immediate release formulation.The pharmacokinetic profile of clonidine hydrochloride extended-release tablets administration was evaluated in an open-label, three-period, randomized, crossover study of 15 healthy adult subjects who received three single-dose regimens of clonidine: 0.1 mg of clonidine hydrochloride extended-release tablets under fasted conditions, 0.1 mg of clonidine hydrochloride extended-release tablets following a high fat meal, and 0.1 mg of clonidine hydrochloride immediate-release tablets under fasted conditions. Treatments were separated by one-week washout periods.Mean concentration-time data from the 3 treatments are shown in Table 7 and Figure 1. After administration of clonidine hydrochloride extended-release tablets, maximum clonidine concentrations were approximately 50% of the clonidine hydrochloride immediate-release tablets maximum concentrations and occurred approximately 5 hours later relative to clonidine hydrochloride immediate-release tablets. Similar elimination half-lives were observed and total systemic bioavailability following clonidine hydrochloride extended-release tablets was approximately 89% of that following clonidine hydrochloride immediate-release tablets.Food had no effect on plasma concentrations, bioavailability, or elimination half-life.Multiple-dose Pharmacokinetics in Children and AdolescentsPlasma clonidine concentrations in children and adolescents (0.1 mg bid) with ADHD are greater than those of adults with hypertension with children and adolescents receiving higher doses on a mg/kg basis. Body weight normalized clearance (CL/F) in children and adolescents was higher than CL/F observed in adults with hypertension. Clonidine concentrations in plasma increased with increases in dose over the dose range of 0.2 to 0.4 mg/day. Clonidine CL/F was independent of dose administered over the 0.2 to 0.4 mg/day dose range. Clonidine CL/F appeared to decrease slightly with increases in age over the range of 6 to 17 years, and females had a 23% lower CL/F than males. The incidence of "sedation-like" AEs (somnolence and fatigue) appeared to be independent of clonidine dose or concentration within the studied dose range in the titration study. Results from the add-on study showed that clonidine CL/F was 11% higher in patients who were receiving methylphenidate and 44% lower in those receiving amphetamine compared to subjects not on adjunctive therapy. 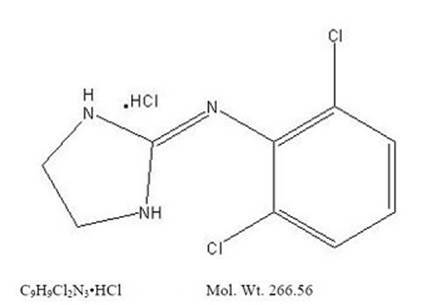 Clonidine HCl was not carcinogenic when administered in the diet of rats (for up to 132 weeks) or mice (for up to 78 weeks) at doses of up to 1620 (male rats), 2040 (female rats), or 2500 (mice) mcg/kg/day. These doses are approximately 20, 25, and 15 times, respectively, the maximum recommended human dose (MRHD) of 0.4 mg/day on a mg/m2 basis.There was no evidence of genotoxicity in the Ames test for mutagenicity or mouse micronucleus test for clastogenicity.Fertility of male or female rats was unaffected by clonidine HCl doses as high as 150 mcg/kg/day (approximately 3 times the MRHD on a mg/m2 basis). In a separate experiment, fertility of female rats appeared to be adversely affected at dose levels of 500 and 2000 mcg/kg/day (10 and 40 times the MRHD on a mg/ m2 basis). Efficacy of clonidine hydrochloride extended-release tablets in the treatment of ADHD was established in children and adolescents (6 to 17 years) in:● One short-term, placebo-controlled monotherapy trial (Study 1)● One short-term adjunctive therapy to psychostimulants trial (Study 2)● One randomized withdrawal trial as monotherapy (Study 3)Short-term Monotherapy and Adjunctive Therapy to Psychostimulant Studies for ADHDThe efficacy of clonidine hydrochloride extended-release tablets in the treatment of ADHD was established in 2 (one monotherapy and one adjunctive therapy) placebo-controlled trials in pediatric patients aged 6 to 17, who met DSM-IV criteria of ADHD hyperactive or combined hyperactive/inattentive subtypes. Signs and symptoms of ADHD were evaluated using the investigator administered and scored ADHD Rating Scale-IV-Parent Version (ADHDRS-IV) total score including hyperactive/impulsivity and inattentive subscales. Study 1 (CLON-301), was an 8-week randomized, double-blind, placebo-controlled, fixed dose study of children and adolescents aged 6 to 17 (N=236) with a 5-week primary efficacy endpoint. Patients were randomly assigned to one of the following three treatment groups: clonidine hydrochloride extended-release tablets (CLON) 0.2 mg/day (N=78), clonidine hydrochloride extended-release tablets 0.4 mg/day (N=80), or placebo (N=78). Dosing for the clonidine hydrochloride extended-release tablets groups started at 0.1 mg/day and was titrated in increments of 0.1 mg/week to their respective dose (as divided doses). Patients were maintained at their dose for a minimum of 2 weeks before being gradually tapered down to 0.1 mg/day at the last week of treatment. At both doses, improvements in ADHD symptoms were statistically significantly superior in clonidine hydrochloride extended-release tablets-treated patients compared with placebo-treated patients at the end of 5 weeks as measured by the ADHDRS-IV total score (Table 8).Study 2 (CLON-302) was an 8-week randomized, double-blind, placebo-controlled, flexible dose study in children and adolescents aged 6 to 17 (N=198) with a 5-week primary efficacy end point. Patients had been treated with a psychostimulant (methylphenidate or amphetamine) for four weeks with inadequate response. Patients were randomly assigned to one of two treatment groups: clonidine hydrochloride extended-release tablets adjunct to a psychostimulant (N=102) or psychostimulant alone (N=96). The clonidine hydrochloride extended-release tablets dose was initiated at 0.1 mg/day and doses were titrated in increments of 0.1 mg/week up to 0.4 mg/day, as divided doses, over a 3-week period based on tolerability and clinical response. The dose was maintained for a minimum of 2 weeks before being gradually tapered to 0.1 mg/day at the last week of treatment. ADHD symptoms were statistically significantly improved in clonidine hydrochloride extended-release tablets plus stimulant group compared with the stimulant alone group at the end of 5 weeks as measured by the ADHDRS-IV total score (Table 8).Maintenance Monotherapy for ADHDStudy 3 (SHN-KAP-401), was a double-blind, placebo-controlled, randomized-withdrawal study in children and adolescents aged 6 to 17 years (n=253) with DSM-IV-TR diagnosis of ADHD. The study consisted of a 10-week, open-label phase (4 weeks of dose optimization and 6 weeks of dose maintenance), a 26-week double-blind phase, and a 4-week taper-down and follow-up phase. All patients were initiated at 0.1 mg/day and increased at weekly intervals in increments of 0.1 mg/day until reaching personalized optimal dose (0.1, 0.2, 0.3 or 0.4 mg/day, as divided doses). Eligible patients had to demonstrate treatment response as defined by 30% reduction in ADHD-RS-IV total score and a Clinical Global Impression-Improvement score of 1 or 2 during the open label phase. 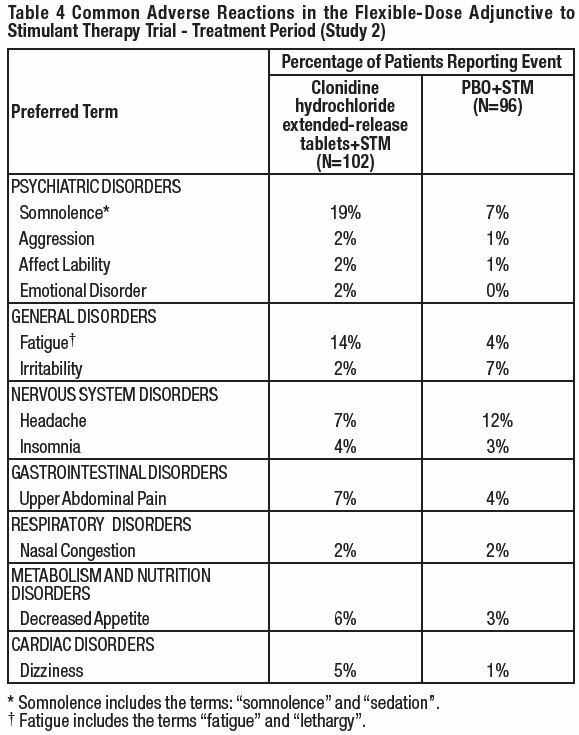 Patients who sustained treatment response (n=135) until the end of the open label phase were randomly assigned to one of the two treatment groups, clonidine hydrochloride extended-release tablets (N=68) and Placebo (N=67), to evaluate the long-term efficacy of maintenance dose of clonidine hydrochloride extended-release tablets in the double-blind phase. The primary efficacy endpoint was the percentage of patients with treatment failure defined as a 30% increase (worsening) in ADHD-RS-IV total score and 2 points increase (worsening) in Clinical Global Impression – Severity Scale in 2 consecutive visits or early termination for any reason. 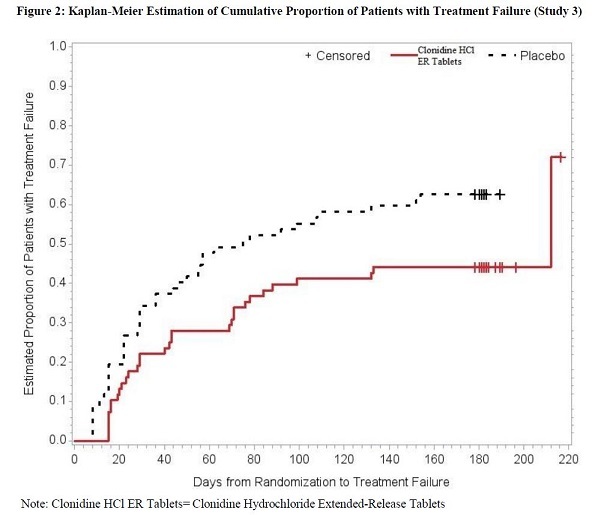 A total of 73 patients experienced treatment failure in the double-blind phase: 31 patients (45.6%) in the clonidine hydrochloride extended-release tablets group and 42 patients (62.7%) in the placebo group, with a statistically significant difference in the primary endpoint favoring clonidine hydrochloride extended-release tablets (Table 9). The cumulative proportion of patients with treatment failure over time during the double-blind phase is displayed in Figure 2. Clonidine hydrochloride extended-release tablets are white or off white, non-scored, round biconvex with debossing ("NL7") on one side. NDC 50742-247-30 – 0.1 mg round tablets supplied in bottles containing 30 tablets.NDC 50742-247-60 – 0.1 mg round tablets supplied in bottles containing 60 tablets.NDC 50742-247-05 – 0.1 mg round tablets supplied in bottles containing 500 tablets.Store at 20°-25°C (68°-77°F) [see USP Controlled Room Temperature].Dispense in a tight container. Advise the patient to read the FDA-approved Patient Labeling (Patient Information)Dosage and AdministrationAdvise patients that clonidine hydrochloride extended-release tablets must be swallowed whole, never crushed, cut, or chewed, and may be taken with or without food. When initiating treatment, provide dosage escalation instructions [see Dosage and Administration (2.1)].Missed DoseIf patients miss a dose of clonidine hydrochloride extended-release tablets, advise them to skip the dose and take the next dose as scheduled and not to take more than the prescribed total daily amount of clonidine hydrochloride extended-release tablets in any 24-hour period [see Dosage and Administration (2.4)].Hypotension/BradycardiaAdvise patients who have a history of syncope or may have a condition that predisposes them to syncope, such as hypotension, orthostatic hypotension, bradycardia, or dehydration, to avoid becoming dehydrated or overheated [see Warnings and Precautions (5.1)].Sedation and SomnolenceInstruct patients to use caution when driving a car or operating hazardous machinery until they know how they will respond to treatment with clonidine hydrochloride extended-release tablets. Also advise patients to avoid the use of clonidine hydrochloride extended-release tablets with other centrally active depressants and with alcohol [see Warnings and Precautions (5.2)].Rebound HypertensionAdvise patients not to discontinue clonidine hydrochloride extended-release tablets abruptly [see Warnings and Precautions (5.3)].Allergic ReactionsAdvise patients to discontinue clonidine hydrochloride extended-release tablets and seek immediate medical attention if any signs or symptoms of a hypersensitivity reaction occur, such as generalized rash, urticaria, or angioedema [see Warnings and Precautions (5.4)].